Classic Pop Ups - Premium Quality, Economy Prices! Free Ground Shipping on all graphic Pop Ups! 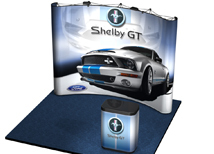 Our line of US made pop up displays are all made in CA for fast turnaround and premium quality. Every kit includes a lifetime warranty on the frame and all graphics have a one year warranty. The most exciting aspect of our US Made Pop Ups is the very low price point. You will never again have to settle for an inferior product because of a tight budget, at Northwest Creative Imaging you can purchase a quality US made display for the price of an import! We offer multiple options on all of our 10 foot pop up display kits including graphics, Las Vegas approved lighting, and Premium Frames! 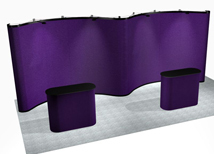 8 foot pop up kits are available in Velcro receptive fabric or full color, 1200 dpi ink jet graphics! High quality and affordable pricing make these a great value! Most economy pop ups cost more than our US made 20 foot displays, but are inferior in quality. Get a high quality display at an affordable price and keep it in the states! US Made Pop Ups are all built in CA by Abex display systems. Abex pop up displays have been the favorite among exhibitors for years and Abex was one of the first US companies to mass produce pop up displays. With the recent influx of imported display products Abex and Northwest Creative Imaging are offering these quality, US made products for the same price as most imported products. Buy with confidence and never compromise on a lower quality substitute! 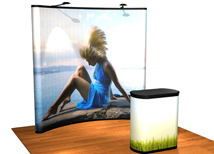 Dont forget to check out our entire line of banner stands to accent your pop up booth! Why purchase a US Made Pop Up? Free Ground Shipping on Select Kits! High Quality, 1200 DPI Graphics!